Jake Glassman and Tracey Gilbert in Rare Birds. Photo by Billy Tompkins. BOTTOM LINE: Rare Birds immerses us in the lives of two high school cyber-bullying victims: a quiet bird-lover who just wants to be himself, and the girl of his dreams. Adam Szymkowicz's Rare Birds tells the story of Evan Wills (Jake Glassman), an introverted high schooler living with his single mother in a small town in Connecticut. Evan’s withdrawn nature, his obsession with birds, and his crush on a popular girl make him the subject of physical, emotional, and online bullying by his classmates. The play draws us into the very real experiences of victimized students and the ways in which modern technology provides a platform for adolescent cruelty. The play itself is well written, with dark comedy, intense drama, and an intriguing plot arc. It sheds a harsh light on cyber-bullying, an issue of growing complexity and frequency within our country. The main characters (Evan, his mom and her boyfriend) are complex and believable, with deep inner lives. The peripheral characters (the school bullies and Evan’s crush Jenny, played by Joanna Fanizza) are less developed, occasionally falling into the realm of cliché. But overall the play keeps the audience captivated—that is, until the tension-filled climax resolves with a less than believable feel-good ending. The set design by Andrew Mannion gives great insight into Evan’s character. Centerstage is taken up by Evan’s bedroom, simply furnished with a twin bed and small dresser. Every available surface is covered with posters, diagrams, and figurines of birds. We learn that even the dresser is filled with bird-themed T-shirts, which Evan is mercilessly made fun of for wearing to school. On the back wall of the ground level space are two windows through which Evan can birdwatch. To the left of the bedroom there is a set of lockers, where school scenes take place; to the right, an upscale restaurant table. The area in front of the bedroom is a neutral space that is used throughout the play. The set perfectly complements the piece without ever becoming a distraction. To draw us in further, a projection area above the physical space is very effectively used to show the audience what is transpiring on Evan’s phone and computer screens. Where Rare Birds misses the mark a bit is in the casting. All of the actors are talented, honest, and convincing, but the actors playing teenagers are simply too old for the roles. 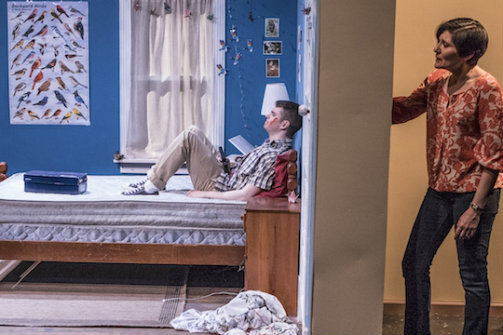 With a cast of college graduates, the play lacks the sense of innocence and naivety that exists in sixteen-year-old kids and the heightened emotional tensions that the high school experience fosters. The age gap creates a disconnect that even great acting can't bridge. Critical moments of intense drama come off as somehow less poignant than the text and the performances would indicate. I think that the issues touched upon would resonate more deeply with the audience and have a stronger effect with more age-appropriate casting. Still, Rare Birds checks off many of the boxes of a great play, and a wide variety of audiences would enjoy it. It shares an important message through a heartfelt story that takes the audience on a memorable emotional journey. Rare Birds is by Adam Szymkowicz. Directed by Scott Ebersold. Set Design is by Andrew Mannion. Lighting Design is by Derek Van Heel. Sound & Projection Design are by Andy Evan Cohen. Stage Manager is Jodi M. Witherell. The cast is Robert Buckwalter, George Colligan, Joanna Fanizza, Tracey Gilbert, Jake Glassman, and Dylan Guerra.